Statistics is something I am drawn to. For practical purposes it is a quick way to evaluate something. In grad school I learned that having measurable outcomes is necessary for all programs. While I butted heads with this idea at first, I understand its importance. I still think it is important to just "feel" something however, so in many life endeavors, I don't bother with the measurable's but go with "gut" decisions. In running, I'm trying to adjust to going on feel more so than being so data and stats driven. Sometimes, the best is not always the most. More miles doesn't necessarily mean being more fit or a stronger runner. As 2014 closes out, I sit and evaluate a years worth of miles, races, and training. I think it is important to spend time reflecting on the past before moving forward with new endeavors. It is no different with running. The end of the year is a good time to reflect on the years training in order to adjust and hopefully improve on the upcoming year. The constant idea that I've been keen to keep in mind as I begin training for a new years worth of races is, "It is not about how many miles, but what kind of miles." Staying fresh and sharp with lower volume but more quality miles is going to be important for sustained participation in ultras. 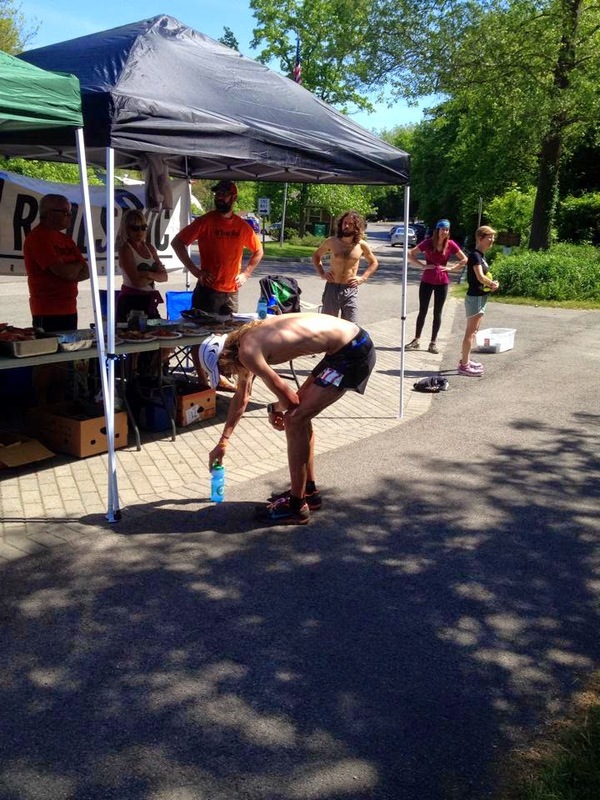 A DNF at Cayuga Trails doesn't take away the experience had. photo by Ron Heerkens Jr.
For the most part, 2014 was a successful year. I could consider this my personal most successful year in terms of competing. After some time off from running in December of 2013, I started training in the new year with one goal in mind: qualifying for Western States at the Ice Age 50 MUC race and then running Western States 100. I started off with a nice win at the Terrapin Mountain 50k and then nailed what is probably my best 50 miler at the Ice Age 50. I PR'd in the 50k by 30 minutes within the 50 miles and became only the 9th person in the 32 year history of the race to break 6 hours. Even though I had such a great race, I missed that Western States spot by finishing just 92 seconds behind 3rd place. This threw off my summer plans but it gave me a chance to run the Grindstone 100 in October, my first mountain 100 miler, where I finished 3rd place. Two weeks later I gutted out a solid marathon time, all things considered, and that capped my year of racing. 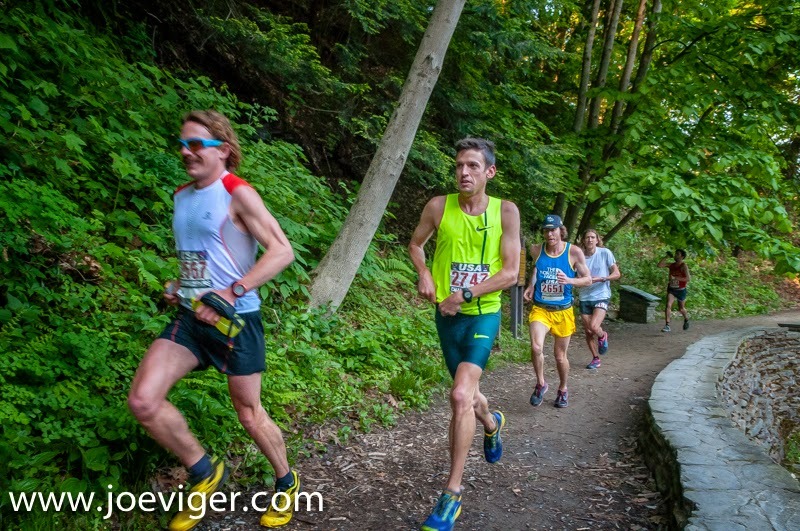 I did't race often, but I had fun at all the races, even the DNF at Cayuga Trail 50 a month after Ice Age. 2014 also brought lots of other great memories away from competing. 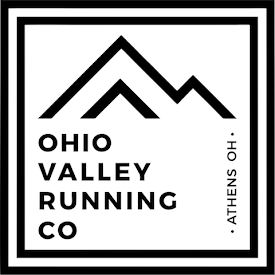 In January I founded Southeastern Ohio Trail Runners (SEOTR), which produced an opportunity for a great memory in April when I directed my first race, the Iron Furnace Trail Run. Race Directing was so much fun and it is going to be something I continue for a long time, with many plans for future races, including the 2nd annual IFTR in April 2015. In May, I earned a Masters Degree in Outdoor Recreation and Education from Ohio University. After graduating, Bobbi and I spend over 5 weeks driving and exploring the American West during the summer, which included stops at the Western States 100 and Hardrock 100, giving a surplus of inspiration to run mountain 100 milers. Later that summer, Bobbi and I found out we were expecting our first child, which has been the greatest blessing of 2014! And that blessing will flow into 2015 when we welcome our little girl into the world in late April! 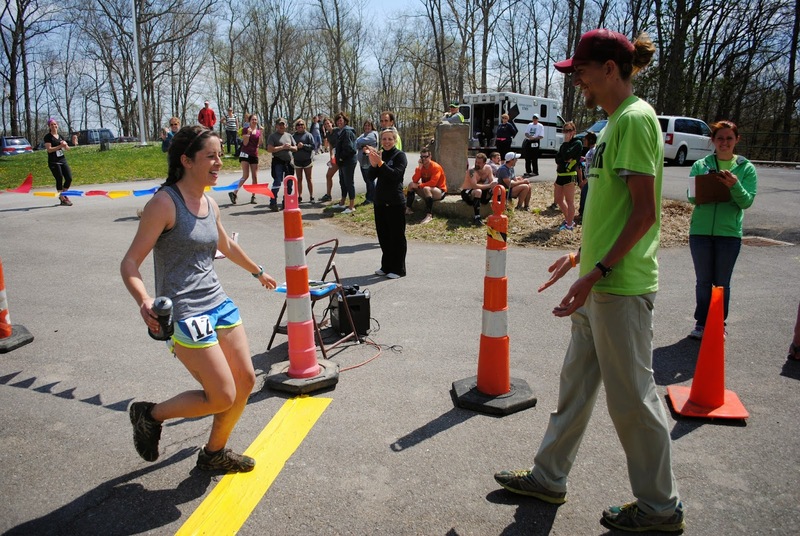 Bobbi finishing the Iron Furnace Trail Run and me welcoming her to the finish as the Race Director! I wouldn't have had such a satisfying year without all the support from my family and friends, especially my wife Bobbi who has become quite the ultra crewess in the two and a half years we've been married. It is truly awesome to have the love and support from everyone around me. 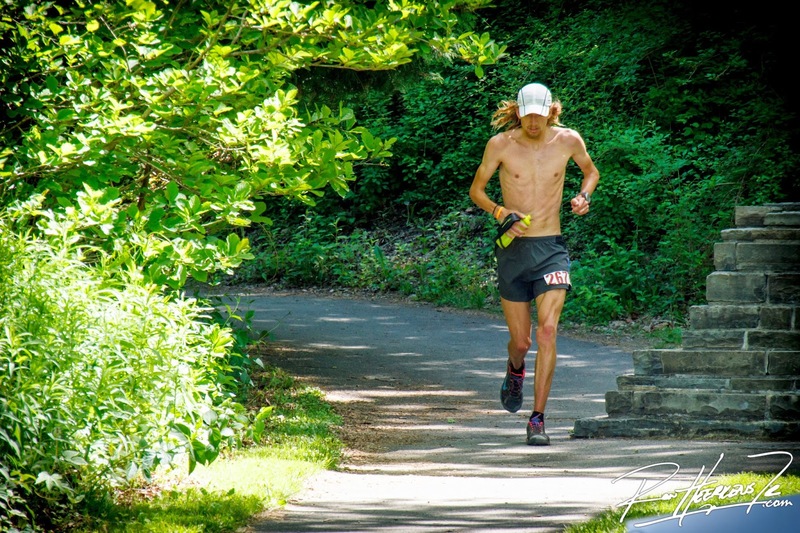 And there is constant inspiration as trail running grows in Southeastern Ohio,especially with the emergence and growth of SEOTR and the Iron Furnace Trail Run and more planned trail races. I've probably shared more trail runs in 2014 with new people than I had in all past years combined. Good vibes with good people on good trails. 238, 396 ft. of elevation gain from May (when I got a GPS watch) to end of year. Onward to 2015 - Happy Trails! Sweet run today. Keegan and I went out to the forest to get a long run in on trails. It was my first time out there and I loved it. I want to run those trails everyday now. It is so peaceful! This day was one of the most influential days of my life and the introduction from Keegan to the trails at the Shawnee State Forest easily affects who I am today. From my sophomore year in college to now, I have visited and revisited this forest dozens and dozens of times for a multitude of reasons - adventure, training, solitude, with friends... Even now living over 2 hours away from the Shawnee Forest, I make it a point to return as often as possible for re-connection with the land and trails that I grew to know and love so well. The forest started out as an escape from the city. The standard 8-mile loop around Portsmouth was getting old. My back hurt a lot, the streets were littered with trash, people harassed us, sounds and cars everywhere. The weekly (and sometimes more) drive of just 15 minutes to the Shawnee State Forest was our escape. Wednesday Trail Tradition. Running on the trails took the pressure away. School and even training was an afterthought for the 2-3 hours in the forest. It was normally a small group of guys, three or four of us at a time. Miles were slow, the trails are rugged and steep, narrow, often overgrown. But it was our escape from the city. The forest became my training grounds. During the last two years of college, the forest didn't take on a new meaning, but a bigger meaning. It was still the escape I searched for in the year prior, but now it was where I trained, and it was my thing. My personal bests improved rapidly my junior year in the 8k and on the track later in the spring. I spent the summer before my senior year working at the golf course adjacent from the forest, and the 2-3 trail runs per week became 6-7 trail runs per week. Now after 2 years of consistent training on trails, I saw even larger improvements in cross country races during my last season. The forest is the source of exploration. Although I went to the forest to run, I was attracted to the mystery of what was hidden beyond the next bend in the trail. There was over 63,000 acres of forest, and over 200 miles of singletrack trails, doubletrack trails, bridle trails, and forest roads to discover. Over the course of three years I drove every car accessible road there was and tried to run as many different routes as I could find. The forest became a place to connect with the land and trails were a portal for this discovery. I felt like a part-owner of the land, because I invested time and energy into being with it, engulfed in getting to know it. Still today, I feel like the Shawnee State Forest is mine. The forest created a wilderness philosophy. 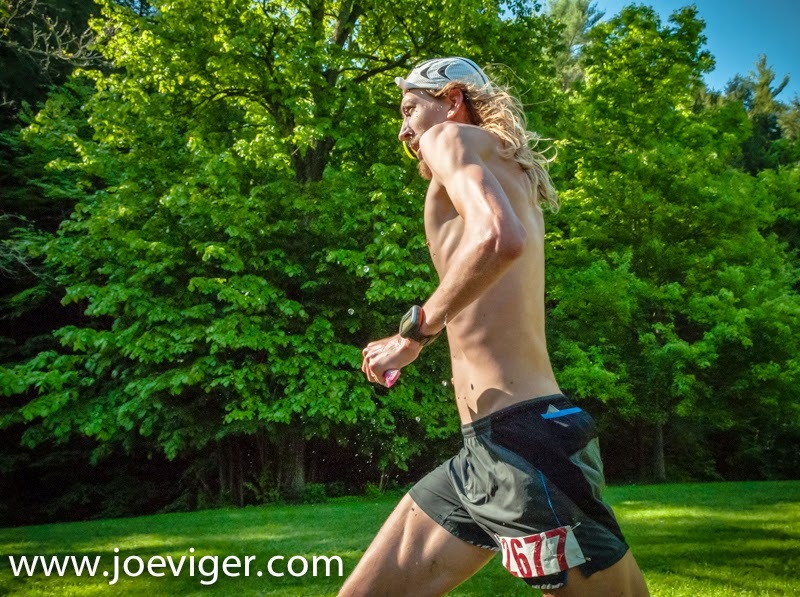 This single moment of introduction to trail running and the Shawnee Forest is what drove me to go to graduate school and earn a masters in Outdoor Recreation and Education. Issues such as logging and recreation management was experienced in large part because I ran through it. I had a daily front-row seat to the devastation of logging taking place in the forest. A perspective that normally only the workers would see from high on the bulldozer seat. I remember many evenings, after the smoke cleared from the workday, I could run through the clear-cut areas, feeling the dirt, and feeling the hurt. I was especially devastated two summers after I graduated from college on a weekend visit to the forest after discovering someone made the management decision to bulldoze the popular 40 mile singletrack backpack trail. The trail is now slowly healing, but it will never return to how it was. So the forest became a place that I formed thoughts and ideas. A desire to protect. The forest is where I became an ultra trail runner. Trail running at the forest for the first time impacted my life in many ways but it led to a desire to start ultramarathon running. It was a natural progression into ultra trail running. I first fell in love with the trails. I wanted to see more and more trails and the only logical and most efficient way for me to discover more trails was to run more miles on trails. So it was fitting that I discovered ultra running as I began to research information online about trails. That is how I found and started ultra running. Before I ever ran an official ultra marathon event, I ran a 40 mile trail run with two of my best friends at the Shawnee Forest. I then started entering ultras immediately after my college cross country competition. Keegan (right) and I on a 40 mile trail run - overlooking logging affects. This past weekend I met with a group of 11 guys for a trail run at the Shawnee State Forest. We ran 20 miles and enjoyed a peaceful winter dusting of snow along the trail. Trips like these revitalize me and I am always overwhelmed with memories and inspiration by being in the forest again. It had only been about 3 months since I was last at the forest, but I always feel like it has been too long. Although my trips aren't as frequent as they were in college, I still feel a connection with the land and trails. There was a 1 mile section from last Saturday's run where I had run ahead of the group a little and was locked into the sweet rhythm of the trail. I felt the "flow." It was like I had ran this trail everyday for the last month, and knew every rock and root and dip. In some way, I think my subconscious did remember this section of trail to every degree. The Shawnee State Forest will continue to impact my life. It has left a permanent mark on my personality and I am grateful for knowing it. Looking at the start of a special Bridle Trail #5 in spring. Although the ultimate day of giving and receiving is upon us, a more pressing date on my mind is December 6th, when the Western States and Hardrock lotteries take place. On this day, I'll be a wishful thinker hoping 1 of my 9 little tickets is drawn from one (or both :/) of the lottery baskets I'm in. Okay, so I may only have 8 out of the 6,601 Western States tickets with my name on it - they say I have a 32.2% chance of getting drawn but I look at my odds as being much lower, but 8 is more than the 4 tickets I had in the lottery last year. I didn't even do the math on the Hardrock lottery because I am just one name on one ticket out the of 1,146 "never" category entrants, some who have 64 or more tickets. Hardrock does not look promising but there is at least some small percentage for my name being drawn. "So, you're telling me a chance." At any rate, if I get into one of these races, it will be my focus race in 2015. Western States has been a dream for many years now and twice I've narrowly missed a spot via one of the Montrail Ultra Cup qualifying races. I more than likely will not attempt another MUC race to gain entry if I am not chosen in the lottery. So to fill my 2015 schedule I've decided to attempt a few of the races in what I consider a new and improved U.S. Sky Runner Series. The first two races in the series are actually within driving distance from where I live in Ohio, still 8 hours and 6 hours, but it beats the cost of traveling West for the others. And hopefully I will make arrangements to be in Flagstaff for the series finale. This looks like a good schedule and with one more race is about the max amount of ultra's that I like to do in a years time. I'll have to find a summer 100 to do if not selected for WS or HR. I'll be 5 months of no racing leading into March but I don't feel there is a need at this point to pound out a dozen ultra's - maybe someday. Here's to a good and successful Lottery Season! Since exhausting my collegiate athletic eligibility and shifting my focus to ultra trail related competition, I haven't raced often or fast. If you look over my race results and race schedule you'll never see a bunch of races, especially not in close proximity. I feel content with finding a few focus races for the year and spending large chunks of time training and gearing up for those races. 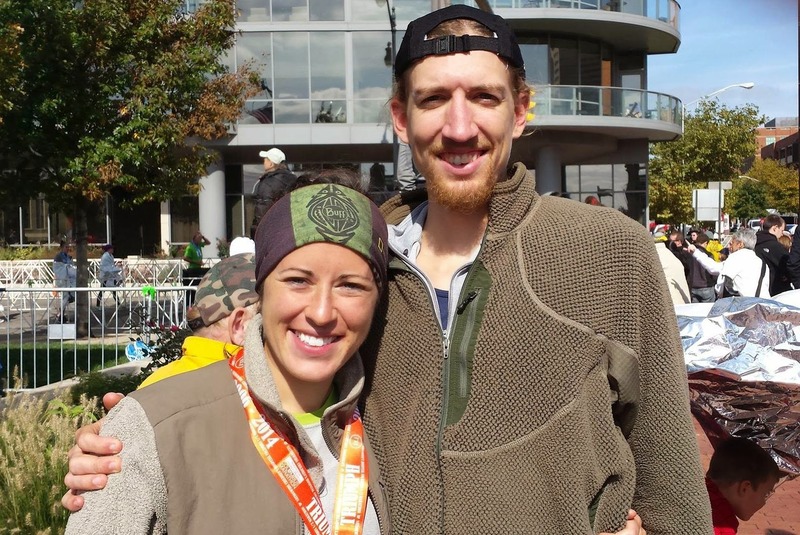 So it was out of the ordinary when I was toeing the line at the Columbus Marathon just two weeks after completing the Grindstone 100. Not only would this race be in close proximity to my last race, but it would also be a shorter and faster race than what I have ran in many years. 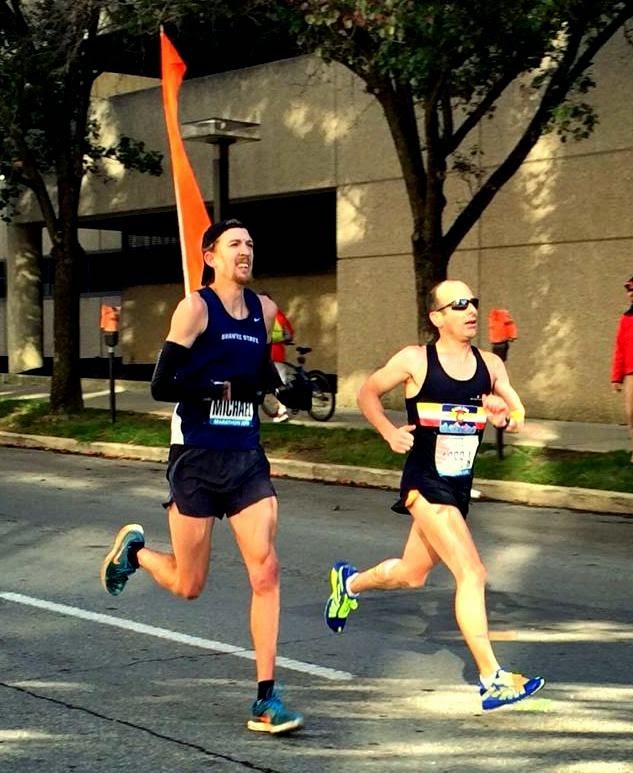 I had run one marathon previous to this years Columbus and it was in 2011 at the NAIA National Championship - since then it has been mostly trail ultras in terms of competition. I went from low-key trail ultras to the pavement in the big city - this would be different! I'm not entirely sure why I decided to run the marathon in such short recovery time after the Grindstone 100. I guess it had to do with my internal desire to find out how much I can handle or how far I can push myself. I knew it would be a grind from the start - but I wanted to face that feeling of straight up sore, dead legs. I knew I wouldn't set my personal best marathon time, but it was not about running the fastest I could for 26.2 miles. This was an experiment, much of what running is for many people. In the two weeks between Grindstone and Columbus, I ran a total of 18 miles, mostly just short jaunts to loosen my legs. Fitness wasn't an issue - weeks upon weeks of long runs in the months prior meant that I would have the fitness to run 26.2 miles. This two week period was a matter of recovering and getting my body to be as healthy and fresh as possible. After a 100 mile race, I will typically do the same thing, except without another hard effort at the end of that recovery period. My muscles and core structure were feeling pretty good in the days after Grindstone. With the course being a mix of technical uphills and downhills, I was never using the same muscle for a prolonged time. I think this made recovery easier than my previous 100's because I was able to spread out the usage in my legs. The only hot spot was my right hip muscles which permeated through my upper leg muscles - once I was sure I had that cleared up I was set to go ahead and run the marathon. Race morning was quite the difference at the marathon compared to the ultras I've been accustomed too. Instead of rolling out of my tent to a quiet early morning in the forest, with a couple hundred racers getting ready, I pulled into downtown Columbus with 18,000 other runners, music blaring on the streets, fireworks, and the whole shebang. I felt out of place and nervous - not nervous from pre-race jitters but nervous about being in the huge crowd. Luckily I was able to get into the elite corral and miss a lot of the hustle, but I was still sort of buzzed from the hype around me. I won't go into much of how the race played out except for a short synopsis. I started out feeling surprisingly fresh and smooth - this might have been from the adrenaline pumping from the festivities at the starting line. I made it through 10 miles feeling strong and in 9th place. I went through the half marathon in 10th place at around 1:16:30. This was fast and not too far off my PR, but I wanted to ride every ounce of good feeling that I could get. The second half of the race presented me the grind that I knew was coming. It hurt - for 13.1 more miles I felt the shock of every step I took two weeks ago at Grindstone reverberate through my legs. My pace slowed from 5:40's in the first half to 6:00's to 6:30's and I was passed by 13 people. In the last mile, feeling rough! The race went exactly how expected - it was a grind. I ended up finishing in 24th place in 2:39:54. The second half was about 7 minutes slower than the first. Even though it was such a grind and even though I was in so much discomfort, it was strangely fun and satisfying pushing through that feeling. Each mile was a small test with separate goals and I was able to tough out some low moments. Even though I was out of my comfort zone and running through an unfamiliar setting, it was a fun and fulfilling event. Road marathons are cool and I'd like to do more than I have in the past, but I will be sticking to trail ultras for the majority of my races. I'd like to take a good shot at training seriously for a fast marathon someday and getting a solid PR, and then be done with competing seriously in marathons. I am not Mike Wardian. Mike can recover like non other and I think it is incredible how he can run such fast times in marathons so short after ultras. Being uncomfortable is just temporary. This is a mantra that I've repeated in ultra's lately and it found its way to my mind in this marathon. Knowing this helps me get through the low moments and push harder. To run successful ultras, even in mountains, there is a need for speed. 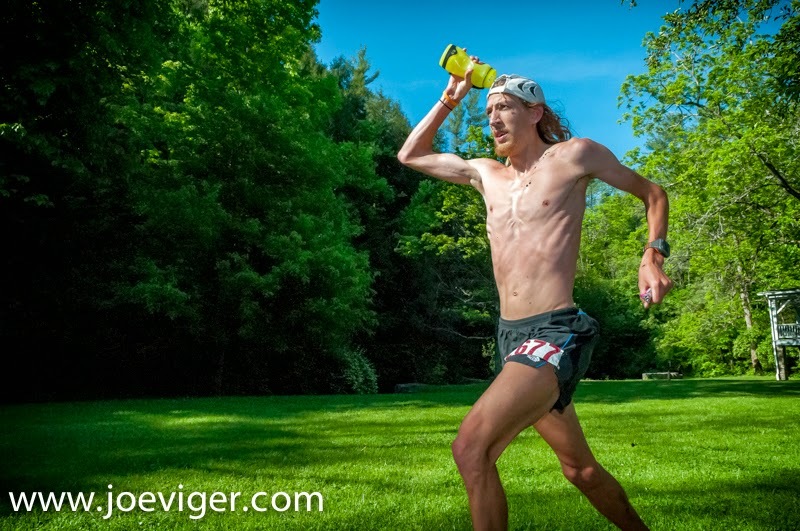 I'm not saying mountain ultra runners need to be pounding out road marathons, but running fast regularly during training adds a lot of strength to the well. As a ultra runner, it is okay to do something different. I have sworn against road marathons too long - it is okay to do something other than run trails :) especially if it helps your training. With Bobbi, who ran the half, after I finished the marathon. 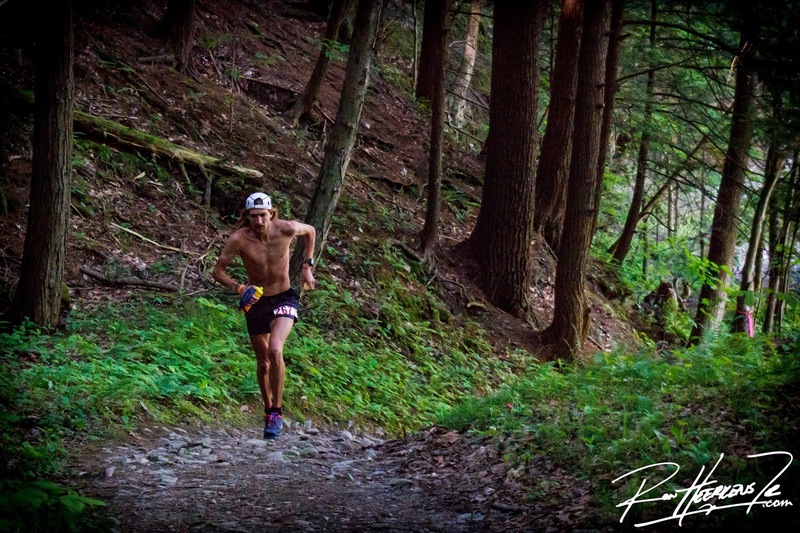 The Grindstone 100 was slated to be the key focus race for my 2014 schedule. 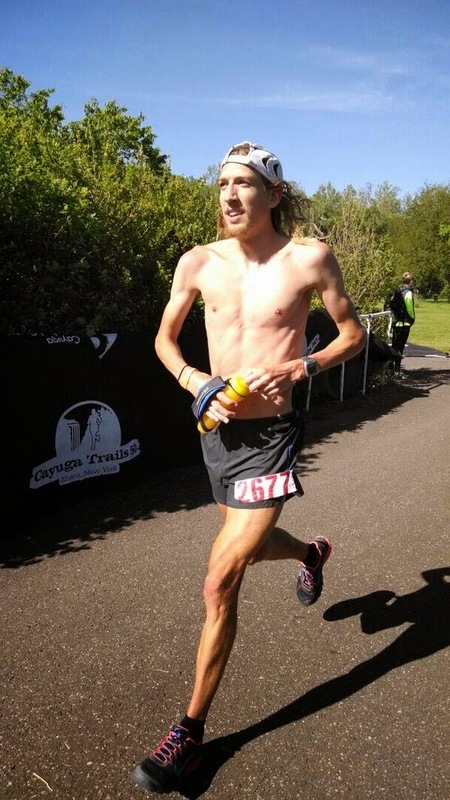 Once not qualifying for Western States via the lottery, and narrowly missing a chance with a 4th place at Ice Age, I directed my focus toward finding and training for a fall 100 miler. I needed another Western States qualifying race in order to enter the 2015 lottery, and after being inspired from spectating this years Hardrock 100, Grindstone was a perfect fit to meet those two requirements. Plus, Dr. Horton was quite convincing when urging me to register for Grinstone as we stood and chatted in Silverton. So it was, I had from mid-July until the first Saturday of October to train and prepare for my first mountainous 100 mile run, not to mention my first ultra that would be ran primarily in the dark. I knew I had a really solid base from many weeks of 100 miles or more plus a steady stream of fast workouts from the spring. I also got a fair amount of running at elevation during a 5 week trip through Wyoming, Oregon, California, and Colorado. The trip West gave me some good time going up big mountains such as the Nolan's route up Mt. Elbert, the Classic Keyhole Route up Longs Peak, and bits and pieces of the Hardrock 100 course. In the 11 weeks between being out West and Grindstone, I just hoped to build on my fitness with more long runs, sprinkled with some fast tempo runs, while hopefully maintaining some mountain fitness. Other sources of apprehension were present as well. First, I am from Ohio so getting a lot of elevation is not easy to come by. Grindstone has over 23,000' of elevation gain, plus the same amount of elevation loss. How would my quads hold up to that amount of downhill running? Running through the night was slightly worrisome as well. I've ran a fair amount of longer runs with my headlamp but not on these types of trails. I knew the Grindstone course was technical and rocky, coupling that with my already less than stellar downhill running ability, and the dark - it had me thinking I would be really slow through these sections. Received the 4 seed - behind Neal (1), Jeff (2), and Brian (3). When Friday rolled around all the apprehensions washed away and I anxiously awaited the 6:00 pm start time. After the pre-race briefing from RD Clark Zealand we all had another 4-5 hours to wait for the start. The topic of the day seemed to be what the weather was going to be like for the start and through the night. There was a good chance of rain and the hours leading up to the start saw just that. It was different having a late afternoon start rather than the typical 5-6 am start of most 100 milers. Camp Shenandoah seemed to be more calm with less rushing around as normal but the rain was still coming down. After trying to get some rest I started to gather my gear and headed over to the start area. 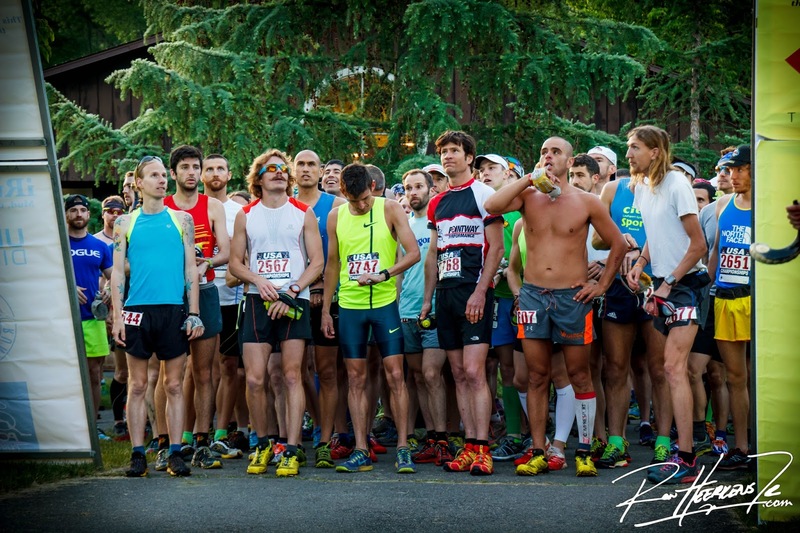 I kissed my wife goodbye and just like that nearly 250 runners headed off for a long adventure in the forest. I can't remember how long it rained - I guess I didn't pay much attention too it because there were other things more important to focus on, namely the fog. I settled into the back of a pack of 10 or so runners at the start. I knew there were a handful of guys that I wanted to keep an eye on who I knew would run a smart and solid race. Josh Finger was way out in front and shortly after punching in at Elliott's Knob (mile 10) I settled into the back of a pack of 4 that included Jeff Browning, Brian Rusieki, and Neal Gorman. We were still chasing Josh, but I could tell this was the correct place to be at this point. Even at this stage in the race I knew the eventual winner would come from this group. What was more challenging than the rain was the fog brought by the warm moist land and cooler air. Our headlamps had a hard time cutting through the water crystals floating through the air, and instead reflected around the dense cloud surrounding us. At this point, I was happy to have three guys to run with, as it increased visibility slightly. With the unstable rocky trail below us, we had to focus more than normal on the footing. Although it slowed us, I skated through this section without rolling over an ankle or tripping, which is good considering my lack of training on rocky downhill and the fog. At some point during this foggy downhill section before the Dowells Draft aid station (22 miles) Jeff was fourth in line and he asked to get around us. He was clearly feeling comfortable on the downhill and it would be the last that I saw of him the remainder of the race. I would have liked to say that I was able to catch back up to him late in the race and actually contended, but he gained the entire way. 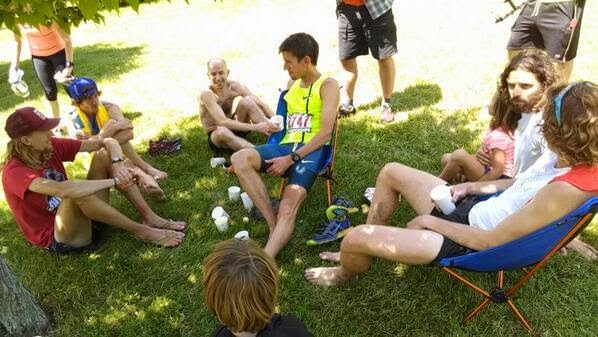 Props to Jeff for a great race, the win, and the completion his 30th 100 mile! Things started to spread out heading into Dowells Draft and then the Lookout Mountain aid station (30 miles). Sometime in this section Jordan Chang caught up to Brian and I and we all basically ran in and out of Dowells Draft together along with Neal. Positions started to juggle around a bit and I moved ahead of Josh after his early lead. I was in second alone for a time being but Jordan once again caught up to me and we ran into the North River Gap (35.5 miles) together. The last section seemed to be going well for me, and I was already a third of the way through. Coming out of North River Gap was when things started to get rough for the first time. Even though I had left Jordan walking up the long climb to Little Bald Knob, I was beginning to feel a low point - my perception of time was getting off, and I kept wanting the next aid station to be there. What seemed like forever, took even longer and the 7.8 miles between North River Gap and Little Bald Knob dampened my spirits. When I finally rolled into the aid station I was still in 2nd place but I was expecting to see lights behind me any moment. After spending no more than one minute at the previous 5 aid stations, I took about 4-5 minutes getting some real sustenance in my body and I needed it desperately! The aid station workers here were great, as they tried to encourage me to get moving - they also had pierogi's, which was the best ultra food that I could have imagined at that point! As I was getting ready to leave the aid station, another light came down the trail and I didn't wait around to see who it was. That big climb right there at 35 miles is where things got rough for me, and again at 65. After Little Bald things didn't get much better for a while. I was able to resume running along the flat grassy road after the long uphill walk, but it was a slow run. Once turning off the grassy road onto the gravel road heading to Reddish Knob (49 miles) that headlamp caught up to me and it was Jordan once again. This was the second time he had caught me and it shows how consistent his race was. We chatted for a while and power-hiked at a quick clip up the gravel road before Brian rolled along. After running through the dark alone for a long time, having a couple companions was uplifting and I was happy to be running, as Brian was rolling along good at this point. Brian and I ran up to the Reddish Knob punch location, but couldn't find the punch. We didn't search long and headed back down the paved road together all the way to the turnaround point. We saw Jeff coming the opposite direction and was informed later that he had a good 35 minutes on us! It was nice to see my wife at the turn-around. I put my head on her shoulder and told her that I was just ready for this to be over. Although I had no intentions of even thinking about dropping out, I was tired, ready for daylight, and in need of a moral boost. I didn't spend too much time here (~2.5 minutes), but Brian left with his pacer and I headed out along a minute or two after him. Much like Jeff, I never saw Brian again after the turn-around, and he secured 2nd place easily. All I was focused on in the next section was turning things around. I knew I had about 15 miles of either downhill or flat running where I could use my strengths. I wasn't as concerned about catching Brian or closing the gap with Jeff as I was on making a bigger gap between me and 4th place, which was Jordan. I was able to run pretty fast on the paved road before the Reddish Knob aid station (54 miles) and kept a consistent forward motion back into Little Bald Knob again where I refueled on Pierogi's and Ginger Ale, another welcomed ingestion. Here though, I learned I was around 15 minutes behind Brian, which means he must have really nailed the last section. Now I had the long section back to Dry River Gap (65.65 miles) and this time it was downhill, which was a lot better than going up. This might have been the best section of the race for me all day. I was able to run almost the entire time into Dry River Gap with some pretty quick sections. When I rolled in to see my wife and crew again, my spirits were high and I was full of energy. This must have been strange to see after being so low last time they had seen me! I learned I was only about 8 minutes behind Brian, and that Jeff had increased his lead to 41 minutes. I was expecting to pick up a pacer at this aid station, either Jeremy Ramsey or Micah Jackson, but they were nowhere to be found when I rolled in, so I just had to leave alone again. I later learned that they fell asleep in their car at one of the aid stations and was barely late in catching me. Luckily it was no harm done as I don't think it affected anything. I did however go through a 5 minute section where I was feeling sorry for myself and wishing I had a pacer but soon realized that I just needed to get over it and run. After the two-thirds point the sun was about to come up but I was entering another low point. I tried to ride the high of the last section but the uphill to Lookout Mountain (72 miles) wore on me. I couldn't take in the beautiful views the sun glistened upon because I was staring down at the rocky terrain that slowed my power hike to a stroll. Even after the aid station when the trial was more grassy and smooth, I walked and walked slow. Once again I was expecting someone to come up from behind me. Eventually the trail went down and I was able to start running again, but running now was with a new added amount of uncomfortable. 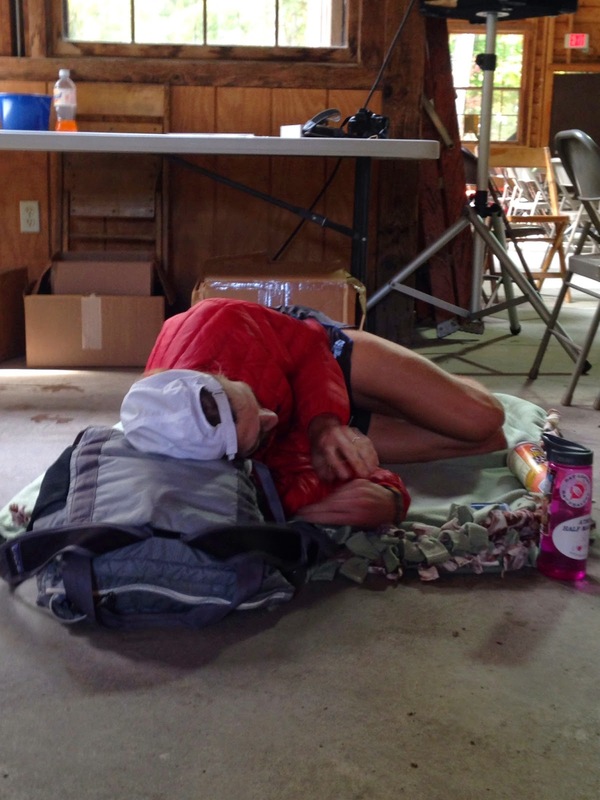 It was being accepted that this would be the feeling I had to endure the remaining 25 miles. As I neared Dowells Draft (80 miles) my pacer, Micah, was coming up the trail. Dowells Draft was a crucial moment in the race. There was a lot of people here trying to help me out including my crew, Horton, Jeremy and Micah, and the aid station workers. They were asking how my nutrition was going, which was not good at this point, and started forcing me to eat. I was able to get a lot of solid food down here and it was needed because Adam Wilcox had just run in the aid station and left right ahead of me. Jordan was also coming in as Adam and I ran up the trail. I had spent maybe 6-8 minutes here and it was time to get going! Coming into Dowells Draft at mile 80 in need of a boost. I promise I'm not that happy to be standing next to Horton. After leaving Dowells Draft with my pacer, I caught back up to Adam and we power-hiked at a good clip up the long rocky climb. This seemed to take forever but all the calories I had consumed kicked in and it was fairly easy going. I was content to tuck in behind Adam with Micah behind me. I focused on making conscious steps and conserving energy while I could. Once cresting the top of the hill Adam had to peel off the trail to tend to his foot, and I was back in third place. I ran the last little downhill section to Dry Branch Gap (87.8 miles) with the mindset that Adam was right behind me still and that Jordan was probably not that far back. I once again was able to get some good calories down (yum, tomato soup) as it was vital for my energy to make sure I did so. I left Dry Branch Gap and made a conscious effort to push hard for a good amount of time. Everything hurt, don't get me wrong, but I was really able to have a good push here. I thought to myself, "if I am able to run hard for 5 minutes, I could double the gap between me and 4th place." I had just walked up the last long climb with Adam, so I thought he might be thinking that I would walk again on this climb, so I ran as long as I could up the hill presuming he would be walking. Although I wasn't running fast, I figured that if I was able to run ~16 minute pace, and he walked ~20 minute pace, I would gain 4 minutes in just one mile. So that is what I did. I cranked hard, ran when I could and walked hard when I had to for the next several miles. Eventually Micah and I left the woods at Elliott's Knob (~90 miles) after a good stretch of trails. Running down the steep gravel road from Elliott's Knob was brutal - this is why they call this Grindstone. My quads were trashed, but luckily they weren't seizing up, so I just pushed through it. Eventually we made it to the more flat and tame horse trails and to the last aid station at Falls Hollow (96.7 miles), where there was just 5 miles to go. 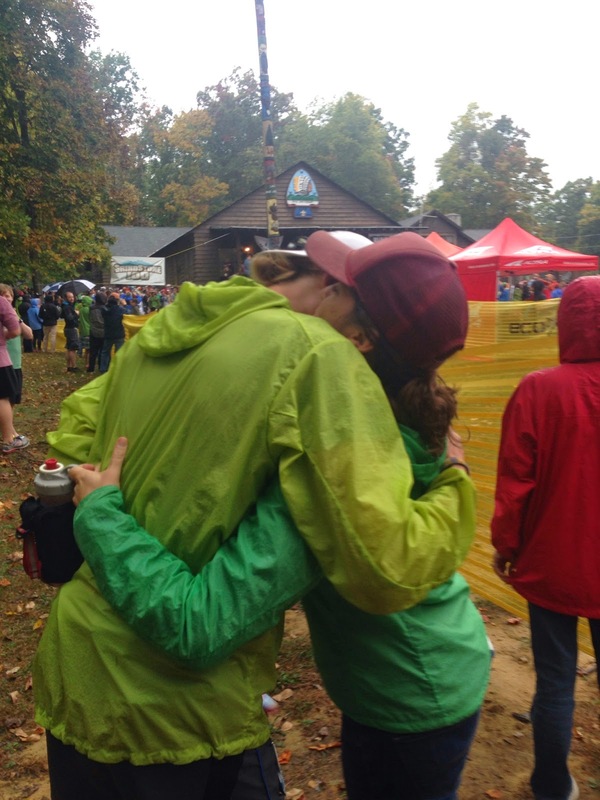 It was refreshing to see my wife and give her one last hug knowing that I was going to finish soon! After getting some more fuel, I was on the home stretch and it felt good! Although I had fallen twice and tripped over a couple rocks, I was able to run the last section at a decent clip as the adrenaline of being finished was enough to power me on. When I entered camp Shenandoah I knew I had two miles to go and I pressed hard to not leave any doubts. The last thing I wanted was to have someone pass me the last two miles! Mile 100 was my fastest mile of the day at 7:50! Rounding the reservoir and coming down the driveway and into the finishing field was a welcome site. After 19 hours and 32 minutes, 101.85 miles, and 23,000+ feet of elevation gain I finished Grindstone in 3rd place! The feeling finishing a 100 miler is indescribable. All in all, I couldn't be any more happy with what went down in the Central Virginia Mountains. Even though I second-guessed myself, I was trained and ready to take this on, both physically and mentally. I executed a solid race plan that saved my legs in the early parts so I could finish solid. I didn't know how I would handle the 23,000' of elevation gain but it went well. I just needed this to make me realize that hiking is okay and the most efficient way to get up a mountain. My day was sort of like a roller coaster. For the first 35 miles, everything was smooth. I was feeling fresh and strong. This was also the section with the most fog. The next 15 miles were rough, followed by 15 solid miles, then about 15 more rough miles. Luckily I had a solid last 20 miles to cap off the day. I think the fog in the early parts forced people to take it easier than they normally would have, in turn making us more fresh for the last half. Finishing Grindstone means I now have a Western States qualifier and a Hardrock qualifier. I will enter both lotteries and be anxiously awaiting the December draw dates to see what my plans will be for next summer. Western States is manageable, but Hardrock is a bit scary, but will do whichever one I get drawn for, and hoping I get a chance to do at least one! I feel much more confident about doing a mountain 100 out west after finish Grindstone well. 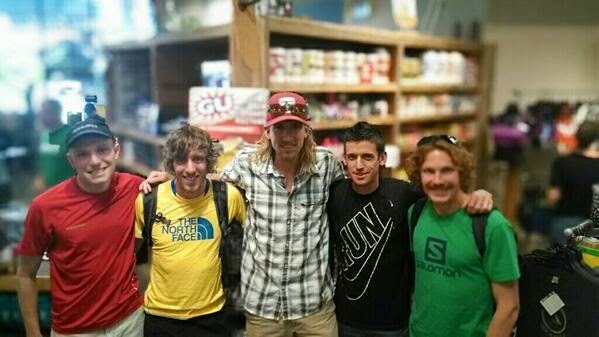 It was great racing with such accomplished 100 milers. At the briefing, Clark recognized those who had ran the most 100 milers. This Grindstone I think was Gary Kniplings 70th 100 mile! That is fantastic and inspiring. Jeff Browning was on his 30th and AJW was over 30 - these are the folks that I admire and look up to in the ultra community. I hope to someday be standing up when they ask who has ran over 30 100 milers. 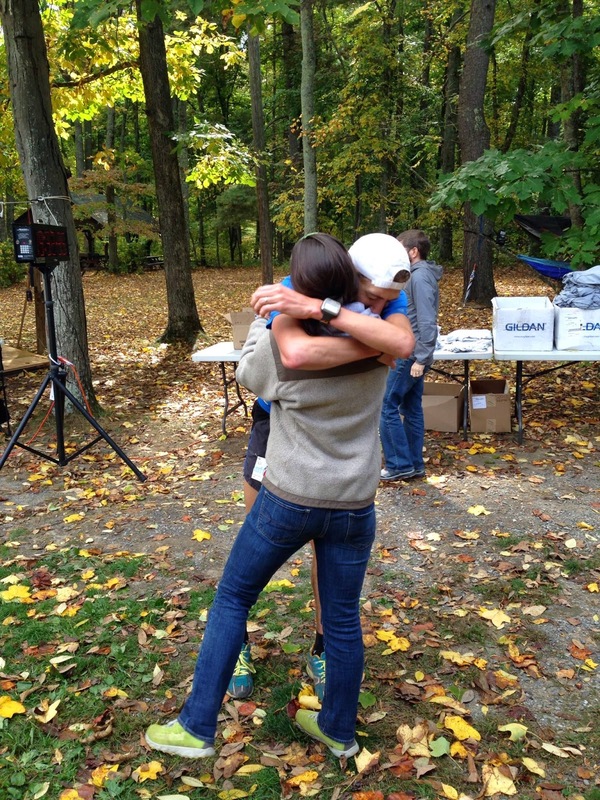 I'll never get tired of this feeling after a 100 miler. A hug from my wife and a hug for the totem pole. These 100 milers take a lot of effort, not just by the crazy folks who run them, but a lot of other people. First, thanks to my wife, Bobbi, for being a great supporter in all respects, not just during the race but during countless hours of training and weeks leading up. I could not do it without her! To my sister for being a great co-crew with Bobbi! You two make a great duo. Thanks to Micah Jackson for pacing the last 20 miles - your course knowledge was great to have and your reminders to eat was crucial! Thanks to Clark Zealand for putting on such great events, everything is smooth and now after being a race director myself, I know how much of an effort this is. The volunteers at the camp provided great hospitality for the runners with food and facilities! The aid station workers are super good at what they do. They had some great hot foods like pierogi's, grilled cheese, tater tots, and tomato soup that fueled me to the end. They constantly encouraged us and kept me moving! Thanks to everyone who supports what I do - this was such a fun and fulfilling adventure! 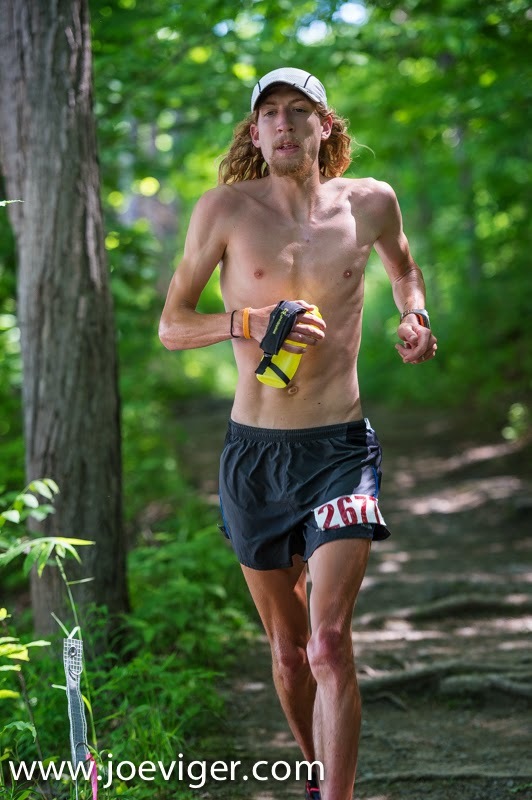 I was a DNF at this years Cayuga Trails 50. Not finishing a race is never fun. It is strange to even sit here and write a blog about it, but this blog is intended to document my trail ultrarunning endeavors so it is only natural to account for the bad along with the good. 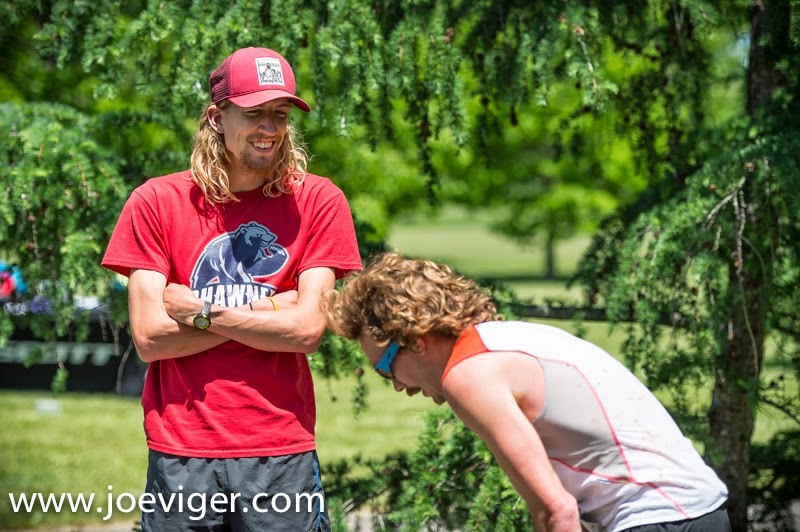 Even if I did not finish the Cayuga Trails 50, I still had a great race experience and overall great weekend of traveling and hanging out with great people. 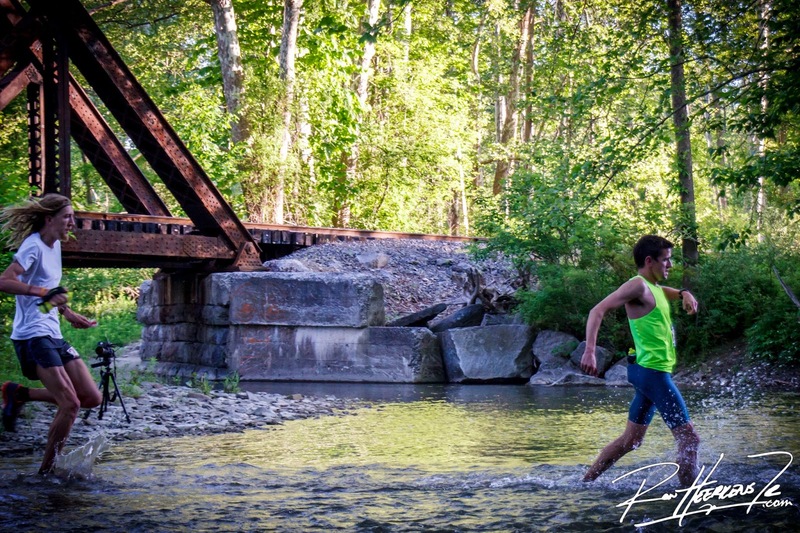 Great photo's of the race and course were shot by Ron Heerkens Jr., Joe Viger, Richard Bolt, and Eric Eagan. I think images and video's of ultramarathons really capture the essence of the sport and people in it! 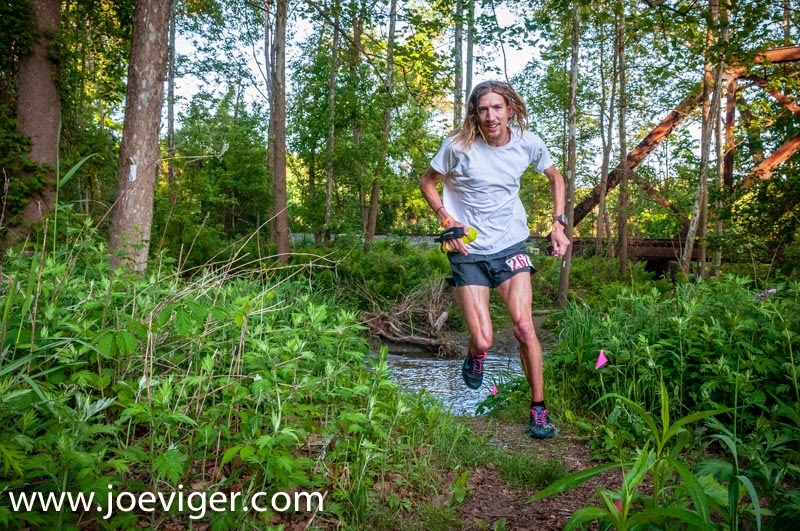 The Cayuga Trails 50 came onto the scene quickly at the inaugural race last year with the announcement of a good amount of prize money and a slew of sponsors and backers. 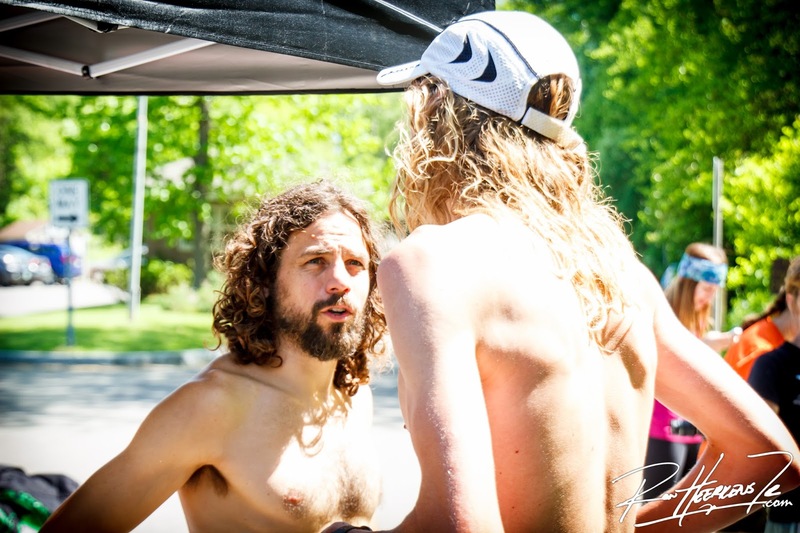 Race Director Ian Golden wanted to assemble a contingent of front-runners to make a competitive 50 mile race in Ithaca, NY. The 2013 version was a showdown with Sage Canaday winning and Matt Flaherty and Jordan McDougal hot on his heals. 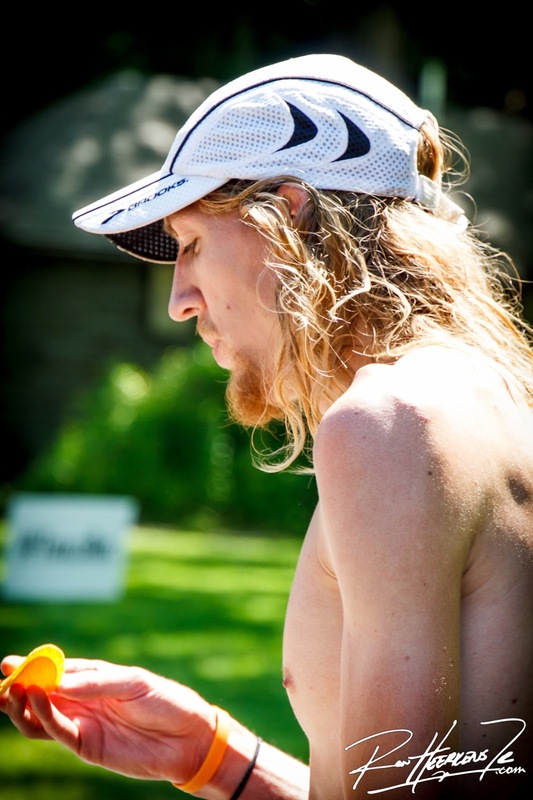 I remember when the race was first announced in early 2013 that I wanted to run it - however, I was still trying to get fit from a nagging injury and my focus was to stay injury free for Burning River 100 later in the summer. And this year my plans were to gain entry into Western States at Ice Age. 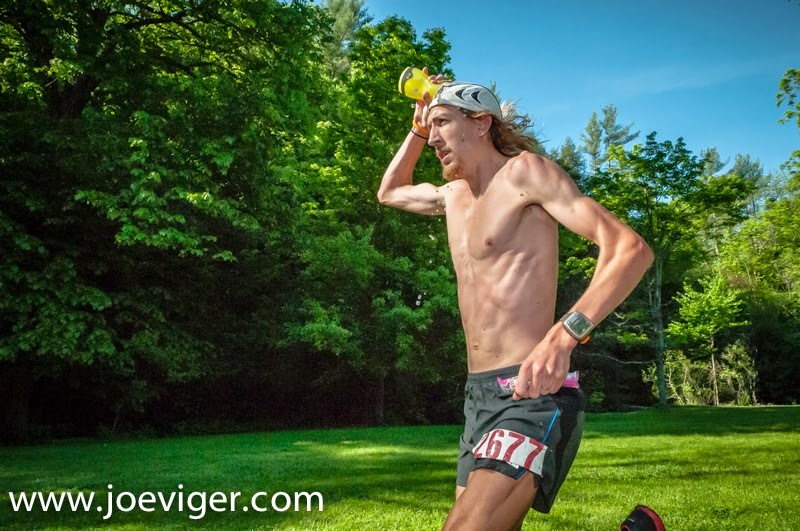 So after not having the chance to run Western States, and feeling recovered soon after Ice Age, I contacted Ian to see if I'd be able to join the pack of other top runners for this years Cayuga Trails 50. Ian does a great job at recruiting top runners for his race. 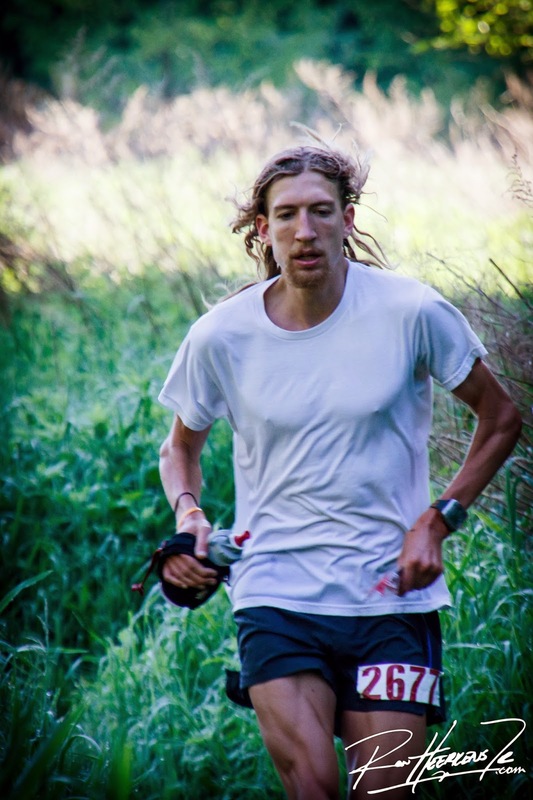 He provides what we need without going over the top and makes us feel very welcomed in a down-to-earth style that is so fitting for the sport of ultra trail running. 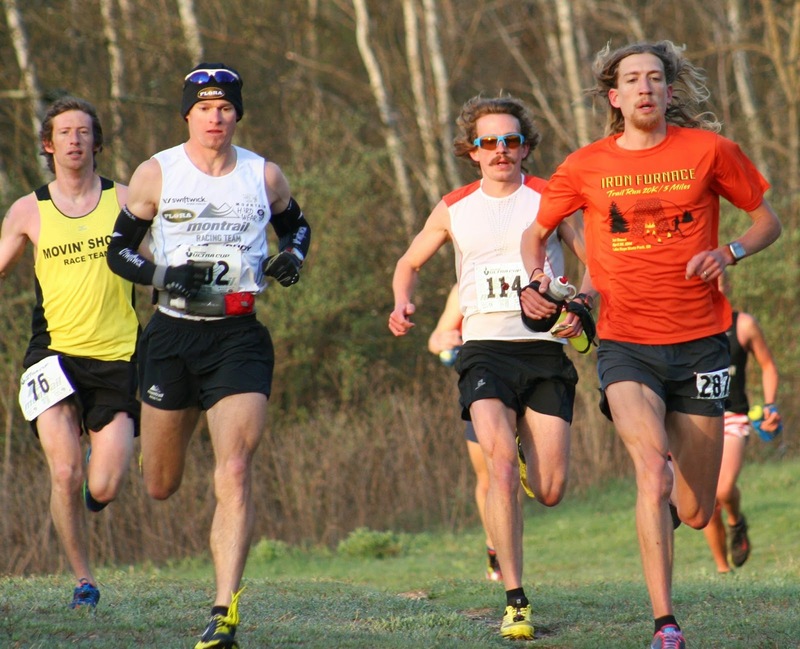 This year Cayuga Trails 50 was the USATF 50 Mile Trail Championship, so it attracted some more media and coverage. Although this race catered to "elites" more so than other races, the weekend atmosphere still had the community feel that most ultras have. 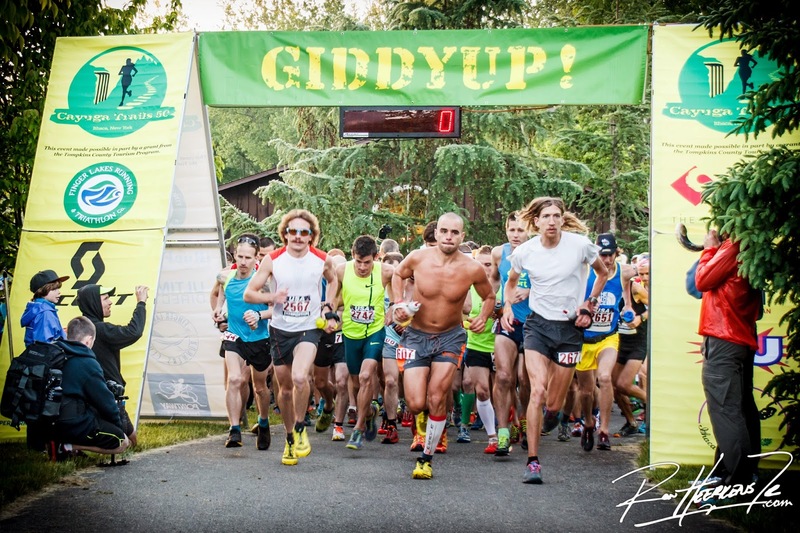 There was an entire week of events centered around trail running including Animal Athletics workshops and the Trails in Motion Film Festival. All of this provided a top-notch event! The race weekend is also the same as the Ithaca Festival, which made for more excitement in the downtown district. Ithaca is a cool place and reminds me of a little bigger Athens, Ohio (although I would say Athens has a little more flare and style ;) ). Photo by Ron Heerkens Jr.
Giddyup! Photo by Ron Heerkens Jr. The race started out what felt like a casual pace. 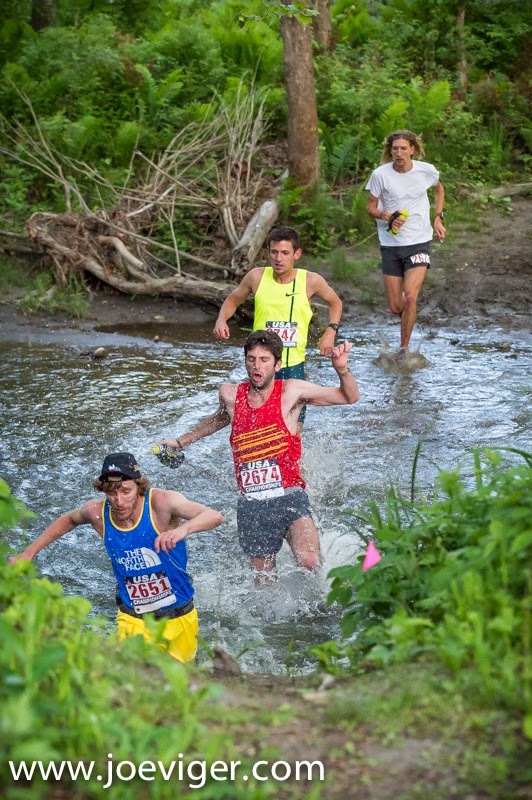 After a pretty tight pack for the first mile or so, it ended up being a lead pack of 5 with Matt Flaherty, Chris Vargo, Jordan McDougal, Zach Ornelas, and myself. I knew these were the guys that were going to be in the front all day. I found myself running off the back of this pack for the better part of the first quarter of the race. I was trying to get a good feel of the rhythm and try to run my own race. I sensed that the pace was fast, and indeed it was as we came through Buttermilk Falls Aid Station (12.4 miles) in around 1:30:00, which puts us on a target that is too fast to achieve. I also began to sense that I was weaker on the steep uphills and steep downhills than the guys in front of me, but I was gaining during the gradual downs and gradual uphills. So for the entire first part of the race I was falling back, then catching the front pack. Crossing the early Lick Brook with eventual winner Chris Vargo. Photo by Ron Heerkens Jr. Soon after the one-fourth mark, I passed Zach and moved into fourth place. Vargo, Flaherty, and Jordan were within sight the entire next section to the Underpass Aid Station but I never pushed hard to get to them, just made sure to keep them in sight and not let them slip too far in front. The course is basically two 12.5 mile out and backs so every section is ran four times for the 50 miles. I was able to see a couple sections of the course the two days leading up to the race so at this point, I was fairly familiar with everything I was encountering. Shortly before Lucifer's Steps around mile 20 I passed Jordan who was stopped on the trail coughing and puking. He had coughing fits for a while more and ended up dropping out at 25 miles. As I ran to the base of Lucifer's Steps I caught up to Vargo and Flaherty and was now with the lead group again. Lucifer's Steps requires hands on knees power hiking for any runner and it was kind of cool battling with Vargo and Flaherty in a true all-out power hike to the top of the stairs. They power-hiked a bit faster than me and was 20 seconds ahead for the remaining miles into Old Mill AS for the second time at 22 miles. After Old Mill AS is when things got a bit interesting for me. I continued to trail Vargo and Flaherty by about 20-30 seconds for the 3 mile section back to the Start/Finish area before the halfway point. I would see them on straight stretching but when there were turns or hills, I didn't see them. I knew I was keeping them pretty close and I pushed hard to make sure they did not separate too far. My goal was to keep them within sight going into the turnaround mark. Coming into the turnaround area I expected to see them coming back after turning around and I could get a good idea at how far back I was. However, when I ran into the start/finish area, there were no signs of Vargo and Flaherty. All of a sudden, all sorts of thoughts went through my head. "Did I go the wrong way?" "Did the course split off and follow a different trail back to the finish?" I was following the pink course markings and knew I came down the exact trail we started, so I explained this to Ian when I came in. I spent a good 2-3 minutes hesitating and trying to figure out what was going on in the start/finish area before heading back up the trail. Ultimately I told Ian that I followed the markings and the exact route we started so he said I should be good and would confirm at the next aid station. Shortly after leaving to begin the second loop, I saw Vargo and Flaherty running toward me and I quickly checked with them and they said they made a wrong turn. This meant that I had ran the correct route and that I was in first place for the first time all day. This sort of took me by surprise and a lot of emotions quickly ran through my mind. I tried to relax and just continue to keep a strong pace. I was feeling the best I had all day, running some of the steeper uphills that I hiked earlier in the day. It wasn't until around 30 miles that Vargo caught back up to me. We ran together for a good 3 miles until the Lick Brook climb, which was the hardest climb of the course. I expected Vargo to reach the top of the Lick Brook climb faster than me, but I didn't expect to feel as bad as I did when I reached the top. When I finally made it to the top, I looked ahead and Vargo was already out of sight. I tried to resume a decent pace but it was challenging. My legs felt incredibly heavy and drained, for the first time all day. All of a sudden, things started going wrong for my body and mental scope. At times I could summon up the strength to run hard but it didn't last. After cresting Lick Brook I ran a 9:30 mile, which I had run in 7:20 earlier in the day. My Garmin shows that mile 36 was 11:10, which was 7:22 during the same stretch at mile 11. My mind lost focus, and I began tripping over small roots and rocks that shouldn't be tripped over. I nearly missed some easy turns in the trail. I stopped to pee for the first time around mile 35, and it was a dark brown color. This concerned me as I normally stop earlier in the race. My mind was weak and I had a hard time convincing myself to keep pushing forward. 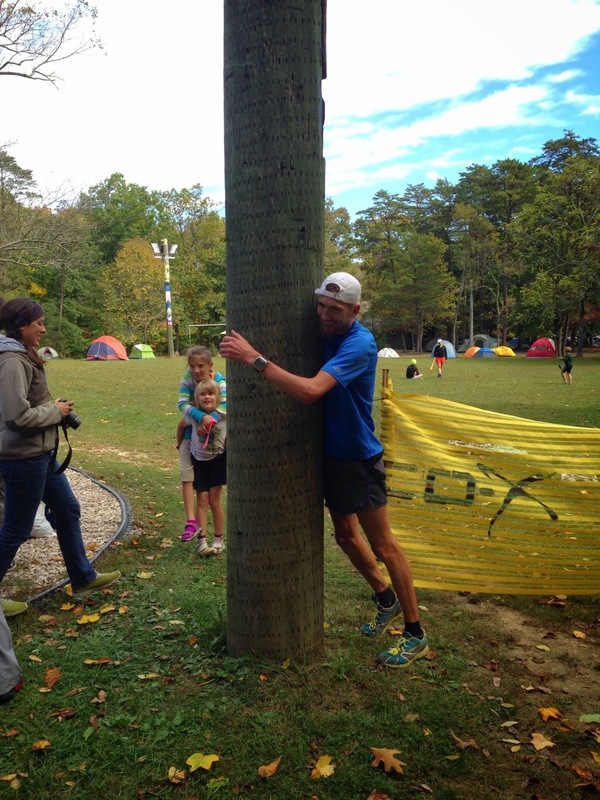 When I arrived at the Buttermilk Falls AS at mile 37.5 I was feeling the worst I have ever felt in an ultra. After 5 minutes of drinking cold drinks, eating salty foods, I sat down, and I was finished. As much as my wife tried to take care of me, my spirit was pretty low and I wasn't feeling any better. I was weak. I pulled the plug because I didn't think I was going to get better and I didn't want to go through another 12.5 miles feeling the way I did. 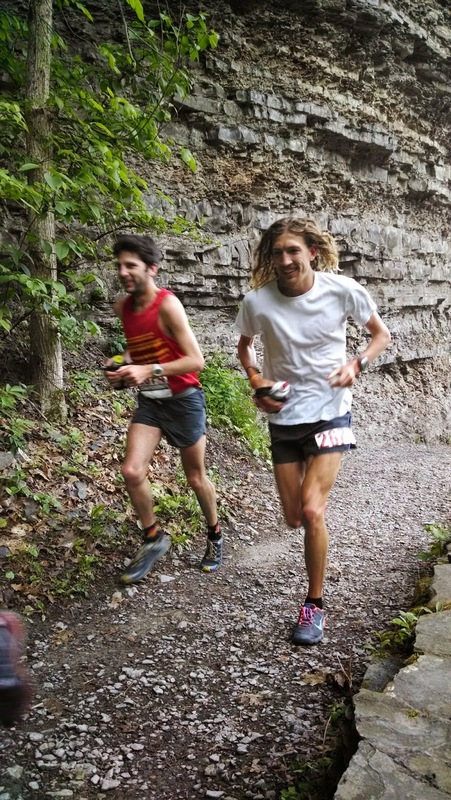 A slow trot into the Buttermilk Falls Aid Station. Photo by Ron Heerkens Jr.
Ian trying to encourage and help me get back on track. Photo by Ron Heerkens Jr. Cramming in real food, nothing seemed to help. Photo by Ron Heerkens Jr. 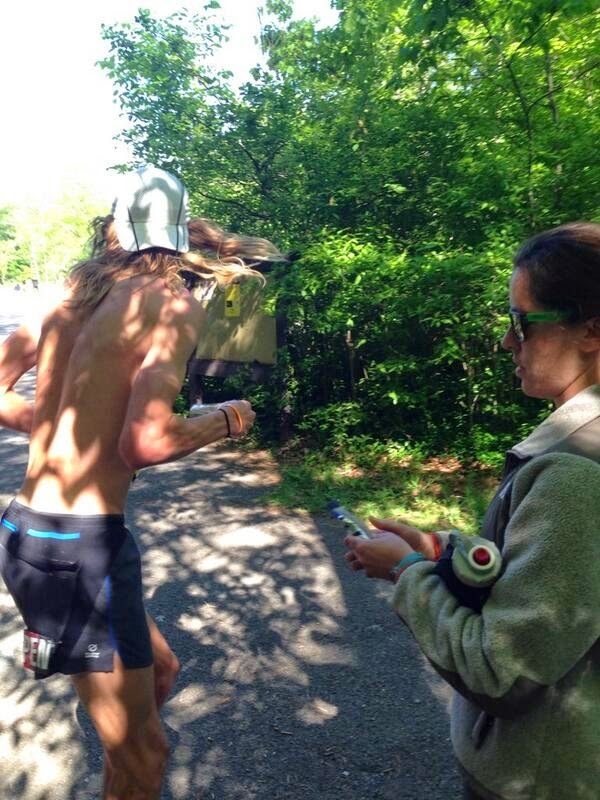 Looking back, it is sort of easy to determine what went wrong for me after 33 miles. For 13 miles, between mile 20 and 33, I pushed hard; first, trying to catch Flaherty and Vargo, then trying to hold my lead. During this 13 mile stretch I ate hardly anything. I don't even remember what I ate but it wasn't more than 100 calories. All the while, it was heating up and getting more humid. I got in a serious hole with nutrition, water, salt, and electrolytes. I was able to get by until the Lick Brook Climb completely zapped me. To make matters worse, I wasn't able to recognize that I needed more fuel after the Lick Brook Climb. I just kept running and stumbling without taking in anything except for a little water. This was my 12th ultra, and until this year, eating a lot was never an issue for me. I used to be able to just eat my way through an ultra. Lately I don't have an appetite for gels or anything while running. So even when I was so depleted, I didn't crave or have a desire to eat anything. This is something that I will need to work on in the future and I will certainly learn from this mistake. After the DNF, I went back to the start/finish area to await everyone. Slowly, I began to feel better. I enjoyed hanging out at the finish line with everyone of the next 6 hours as people finished. A huge congrats to Chris Vargo for finishing it out. We went out hard but Flaherty still pushed through to finish third. One of the more smarter races of the day came from Tristen Williams who finished 2nd and was closing hard on 1st. Everyone who ran and finished did a great job! This course is no joke and the steep ups and downs will test your fortitude. I hope to come back and get a bit of revenge on the course and my nutrition. This was a great experience and I have no regrets other than not staying on top of nutrition and fueling. Rookie mistake for someone who has gone through these ultras before! Next time I'll be more aware of what I need even when my body is not telling me it wants something. Sometimes you just need to force the gels and calories down. Overall, it was a great weekend and great racing. I am at least glad I put up a fight and made the competition interesting for about 33 miles. Ian puts on a great race and I'd come back to run one of his races any time. 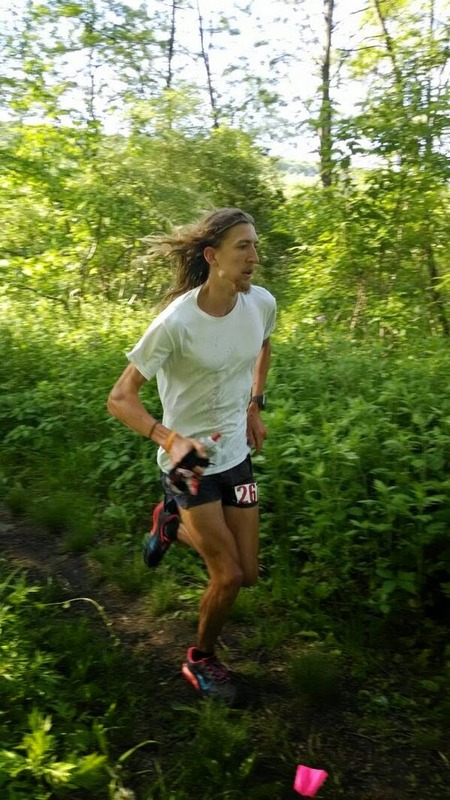 The Virgil Crest 100 is already on my radar! 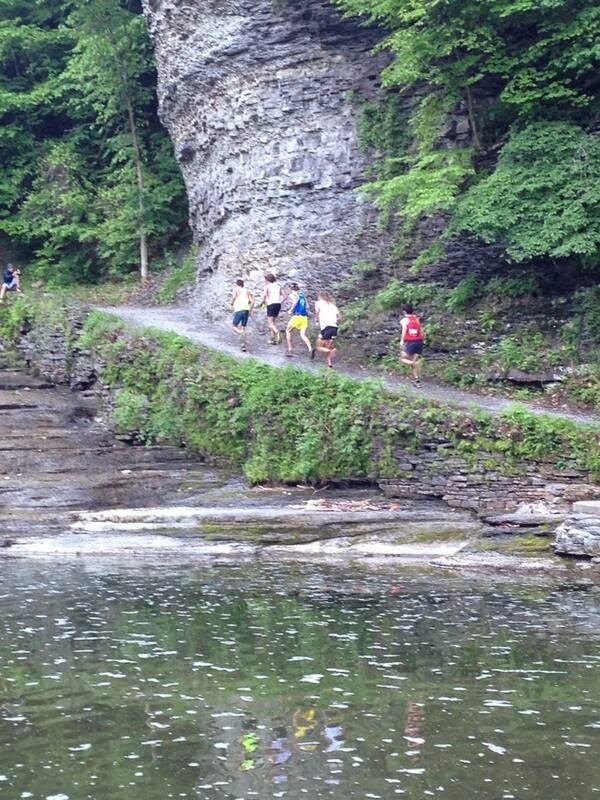 The entire Finger Lakes Running community is great and they embody the spirit of trail ultra running! There are no immediate races on my schedule right now - I want to make sure I am fully recovered before I start any more higher mileage weeks. I hadn't taken a day off since December until after the race so that was a solid 22 weeks of training before any break. Time for rest and recovery to get ready for some late summer and fall races!